Like a Timex watch and like Rocky himself, the Rocky franchise takes a licking and keeps on ticking. Here we are, four decades later, and Rocky Balboa is still going. “Creed,” written and directed by Ryan Coogler in between “Fruitvale Station” and “Black Panther,” was an unexpected upgrade, as Adonis Creed, the son of Rocky’s opponent in the original Oscar-winning film took over, angry, with a chip on his shoulder, and itching for a fight. Michael B. Jordan is a brilliant actor with sizzling screen charisma, and it was, well, a knockout. He was on his way to becoming a champ and to making a life with a beautiful hearing-impaired singer (Tessa Thompson). Coogler produced this next chapter, Creed 2, written by the original Rocky, Sylvester Stallone, who returns as Creed’s coach and mentor, the guy you always want in your corner. And one thing Stallone knows how to do is step up the stakes. Entertainment Weekly once wrote that “It’s hard to find anything more 80’s than Rocky IV.” Just before the Cold War would draw to a close, “Rocky IV” had Stallone battling a Soviet fighting machine named Drago (Dolph Lundgren) with an ice queen of a wife (Brigitte Nielsen, who would be Mrs. Stallone briefly). After Drago kills Apollo Creed in the ring, Rocky fights him on behalf of Apollo and of course on behalf of America and freedom, and Rocky-ism. And now, in the eighth film in the series, Drago’s son, trained by his bitter, brutal father (Lundgren again), challenges Adonis, newly crowned heavyweight champion, to a fight on behalf of Apollo, America, freedom, and Rocky-ism. One fighter is bigger and tougher, but he has been trained with hate. The other has been trained with heart . Time for the classic Bill Conti score again. Michael B. Jordan is mesmerizing on screen and so completely authentic that he makes even the soapiest moments real and engrossing. Is Rocky going to refuse to train Adonis to fight Drago’s son (Florian Munteanu) just to create an opportunity for extra drama? Will there be ten-counts? Will there be a proposal, a baby, a reconciliation? Maybe two? Cornerman pep talks about “this is your house” and commentary on the business side of boxing (“The belt ain’t enough — you need a narrative, something that sticks to the ribs”)? Decadent Russian oligarchs in a dining room that looks like it belongs to Count Dracula? A camera shot that makes us feel like one of Drago, Jr.’s fists is coming right at us? Callbacks to “Rocky IV?” (In that film, Lundgren said only 46 words. In this one, he says a few more but some of them are the same words. Nielsen, on the other hand, is in the film but her ex-husband did not give her more than a few words to say.) Dramatic moments in the audience, as women watch the fights — or don’t? All of that, plus, in case we miss anything, a lot of expository narration from the sports announcers. Oh sure, it’s cheese. But it’s Rocky, and it still works. Parents should know that this film includes extended and graphic scenes of boxing with severe injuries, references to a boxer who died following a fight, brief strong language, and a non-explicit sexual situation. Family discussion: How did the different goals Adonis and Viktor had for the fight affect them? What made Ivan Drago change his mind? What do we learn from Adonis’ night with the baby? I’ve got to warn you — you’re going to need to see “Ralph Breaks the Internet” at least twice. And I’ve got good news for you — it is well worth it. 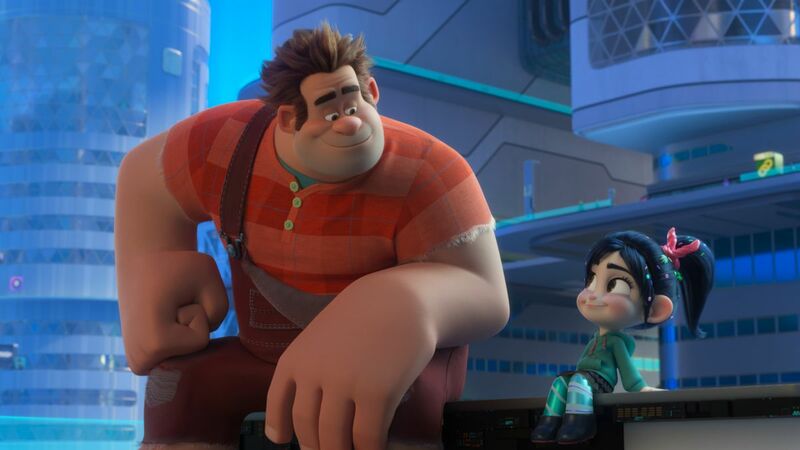 The sequel to “Wreck-It Ralph” is “Ralph Breaks the Internet” and just like the Internet itself it is bursting with endless enticing distractions. But in the midst of all that is also a wise and warmhearted story with endearing characters. And it is a rare comedy that understands it is not enough to refer to a specific cultural touchstone; it has to have something to say about it. What it does have to say is so shrewd and funny it may merit a third viewing. “Wreck-it Ralph” was about characters in old-fashioned video arcade games, the kind they used to have before we had laptops and phones that we could play games on. Wreck-It Ralph (John C. Reilly) is not exactly the bad guy but the menace in his very old-school game. All he does is break things that are repaired (if the game player is successful) by Fix-It Felix (Jack McBrayer). He ends up visiting some newer games, including a military first-person shooter game and a racing game called Sugar Rush, with the cars made of candy. There he meets a brash little girl with a pixel-shaking “glitch” named Vanellope. The happy ending resolves various issues and Ralph and Vanellope end up friends. As this movie begins, everything seems to be going fine. Ralph is very happy meeting up with Vanellope every night after the arcade closes to talk about, well, everything. But the arcade owner (Ed O’Neill) is upgrading. “What is wiffy?” Ralph wants to know. That would be Wifi. And the next thing they know, Ralph and Vanellope are whisked into the big, wild world of the Internet and like Dorothy in Oz and Alice in Wonderland and the Pevensies in Narnia, they will have many thrilling adventures and meet many astonishing characters before they find their way home. The characters’ idea of what home and friendship mean will be changed, shifted, or enlarged by their experience, one of the film’s most thoughtful elements. But on the way there we have so much fun seeing the most familiar — and some of the most frustrating — elements of the digital world reflected and personified, and writer/directors Phil Johnston and Rich Moore take advantage of Disney’s unsurpassed line-up of characters to fill the movie with surprising and hilarious cameos. The highlight is the funniest scene you will see at the movies this year, when Vanellope ends up in a room with the Disney princesses (almost all with the original voice talent). What’s great about this is that Johnston and Moore are the rare filmmakers who know that referring to a cultural icon is not enough; you have to say something about it. And what they have to say about the princesses strikes the perfect balance between affection and irony. No more waiting for a prince to come. These sisters are doing it for themselves. Also stopping to sing by water at some point, though. The film is not just smart about culture, digital and IRL. It is smart about people, and especially about our fears and insecurities. It’s a rare film for children that goes beyond “friends are great!” and explores the delicate negotiations of relationships between people who may have different ideas about what they want. A wise man taught me a long time ago that everyone has different tolerance levels for ambiguity and that each of us has different tolerances for ambiguity across a wide range of categories. Someone can be comfortable taking big risks in one area, but not another. “Ralph Breaks the Internet” has a deep understanding that even adults will find illuminating. Plus, it is a ton of fun and if you stay ALL the way to the end there is one more sly joke. Parents should know that this film includes fantasy/video game-style peril and violence, chases, crashes, no one seriously hurt, and brief potty humor. Family discussion: How are Ralph and Vanellope alike and how are they different? Which is your favorite Disney princess and why? What is your favorite thing about the Internet? “Fantastic Beasts: The Crimes of Grindelwald” is a little less fantastic than the first film in this new series set in the Harry Potter universe. It serves as something of a bridge between the first Potterverse film set in the past and outside of England and whatever chapter comes next. The first film introduced us to a new set of characters and settings, taking place mostly in New York in the 1920’s. J.K. Rowling is still more of a novelist than a screenwriter, and the screenplay is unwieldy and cumbersome, with too little investment in the characters, too much focus on the secondary details, and too little attention to the stakes of the story. As we glimpsed at the end of the last movie, our evil villain is Grindelwald, played by Johnny Depp with bleached out hair and one light blue contact lens. And he’s something of a wizarding world white nationalist. While magics and non-magics (muggles in the UK, no-majs in the US) have existed peacefully side by side for centuries, Grindelwald wants the “pure-blood” magic people to reign over the mixed-race magics and the humans. Our hero is still Newt Scamander (Eddie Redmayne), who is much more comfortable with magical creatures, even the destructive and dangerous ones, than he is with people, magic or not. With people he looks away and mumbles. With creatures, he instinctively knows how to make them feel safe, maybe because he feels safe with them. Really, that’s plenty for a movie. But Rowling piles on lots of characters and lots of storylines and lots of world capitals — so many we might forget we’re not in a Bond movie, except that they all have the same chilly, sepulchral, beige color scheme. The movie is cluttered with layers of references to the Potterverse, including a visit to Hogwarts (young Dumbledore! ), boggarts, polyjuice potion, and an encounter with Nicolas Flamel. And it is cluttered with mini-plots that don’t go anywhere (as Chekov should have said, if you’re going to introduce a character who turns into a snake in the first act, that snake better save the day in the third) or mini-plots you wish didn’t go anywhere (a search for a lost brother, a romantic misunderstanding that would have seemed tired in a “Brady Bunch” episode). Plus, don’t put the wildly talented Ezra Miller in a movie and give him nothing to do but look glum. Instead of a missing puzzle piece in a complex, thoroughly imagined world, it is more like fan service. There is much to look at and much to enjoy but I can’t say that it’s Fantastic. Parents should know that this film includes extensive fantasy peril and violence, characters injured and killed, and some disturbing images. Family discussion: What would your boggart be and how would you make it ridiculous? Why do Grindelwald’s followers believe he is right? My review of Goosebumps 2: Haunted Halloween is on rogerebert.com. 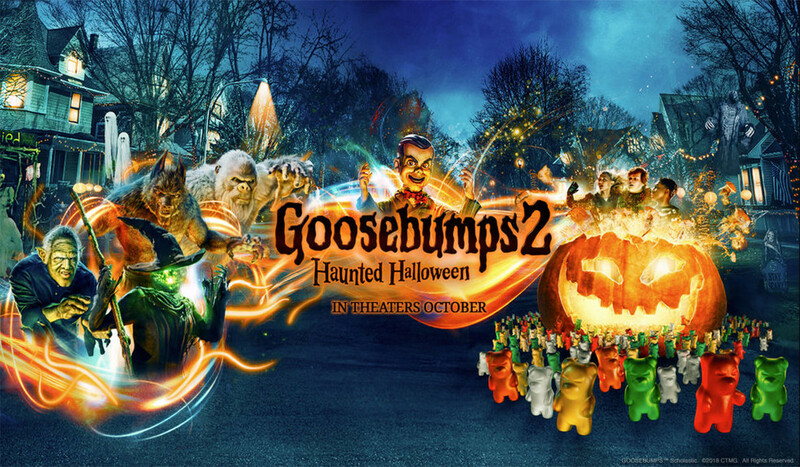 The first “Goosebumps” movie was a lot of fun, with Jack Black playing real-life author R.L. 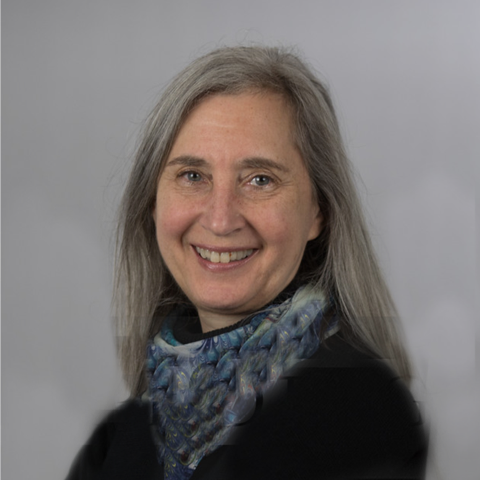 Stine, whose hundreds of spooky-fun books for tweens have sold hundred of millions of copies. This sequel, with only a brief appearance by Black, is blander, with lower-wattage talent on and behind the screen. But the special effects are still top-notch and it is a pleasant little scare-fest for the Halloween season. Parents should know that this film includes extended spooky-scary content with scary monsters, ghosts, witches, boo-scares, peril, action/cartoon-style peril and violence, some potty humor and schoolyard language. Family discussion: Which is the scariest monster in the movie? Why do people like scary movies? Pretty music, pretty scenery, pretty people – here they go again, my my, and how can we resist them? Lesser songs, better singers, higher platform shoes, more romance, a horse, a goat, a boat, a romantic last-minute wedding interruption, returning cast members and a whole new group to play younger versions of the older characters. “Mamma Mia! 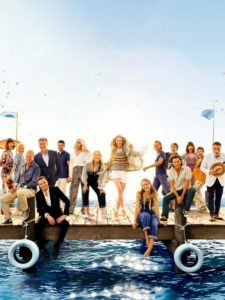 Here We Go Again” finds the young woman with three fathers (Amanda Seyfried as Sophie) about to realize her mother’s dream of a luxury hotel on the idyllic island of Kalokairi (the Greek island of Skopelos in the original, in this one the Croatian island of Vis, which gave the production tax breaks). It is bittersweet because her mother (Meryl Streep as Donna) has died. She and her step- and one of three possible biological fathers (Pierce Brosnan), conveniently an architect, miss her dearly. “It will get better,” she reassures him. “Yes, just not quite yet,” he answers. Working on the grand opening party makes her feel closer to her mother. But she also misses Sky (Dominic Cooper), who is getting training in hotel management and has been offered a dream job half a world away. She also wishes her other two fathers could be there for the opening, straight-laced British lawyer Harry (Colin Firth), who is negotiating a big merger in Japan, and Bill (Stellan Skarsgård), who is getting an award for being Sweden’s greatest person because this movie does not really care enough about minor details to Google an actual award or invent a plausible one. And why should it? This is a movie that asks us to believe Cher is Meryl Streep’s mother. And that someone could have a daughter in 1980 who would still be in her early 20’s. While Sophie is planning “the most incredible party of all time,” the primary focus of the film is on filling in the dot, dot, dots of Donna’s origin story, from her college graduation in 1979 (the math does not really add up here, either), her friendship (and performances) with Tanya (Jessica Keenan Wynn as the deliciously acerbic younger version of the character played by Christine Baranski) and Rosie (Alexa Davies as the younger version of the tender-hearted character played by Julie Walter), and her encounters with Bill, Harry, and Sam (younger versions played by Josh Dylan, Hugh Skinner, and Jeremy Irvine). And then she meets Sam, who wins her heart and then breaks it. By then she is pregnant, and by then she knows that this island is where she wants to make her home. There is more skill in the crystalline harmonies, rock star poses, screen saver vistas, and segues between time and space than in the storyline, which is both too sad and too silly. Pierce Brosnan still can’t sing. The script often sounds like it was badly translated from the original Swedish. But it’s a cool treat on a hot summer evening, and let’s face it — you couldn’t escape if you wanted to. NOTE: Wynn is the latest in five generations of one of the most luminary of show business families, including actors Ed Wynn (“Mary Poppins”) and Kennan Wynn (“Dr. Strangelove”) and writer Tracy Kennan Wynn (“The Longest Yard”). And of course, be sure to stay through the end credits for a final musical number! Parents should know that this film includes sexual references and non-explicit situations, questions of paternity, some sexual humor, childbirth scene, some mild language, and some alcohol. Family discussion: How do you bolster your friends and family? What makes your soul shine? How do you make a complicated problem simple? If you like this, try: the first “Mamma Mia” and “Walking on Sunshine” and read Susan Wloszczyna’s interview with Judy Craymer, who came up with the idea of turning ABBA’s songs into a play.